This easy, veggie-packed vegan soup comes together in no time, but tastes like it simmered for hours. Veggie Soup for the Soul. That’s what we’ve got right here. 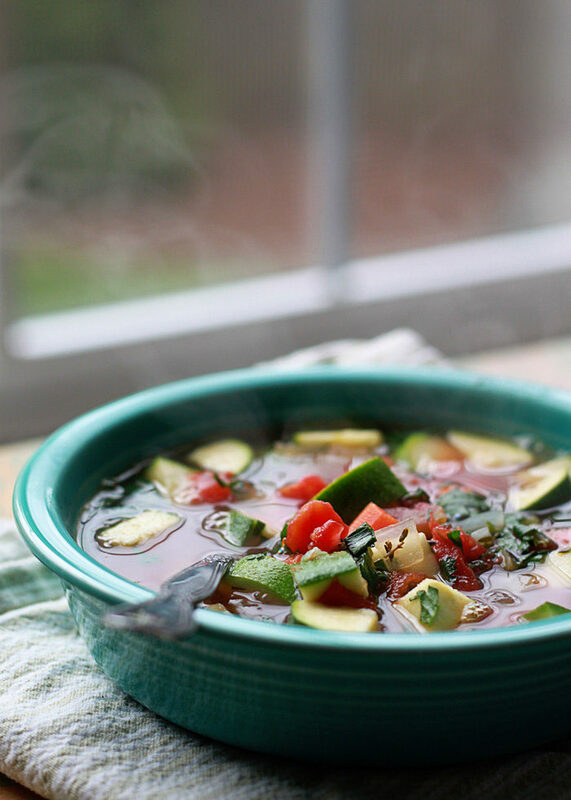 And also veggie soup for our taste buds, our bellies, and our frazzled nerves. 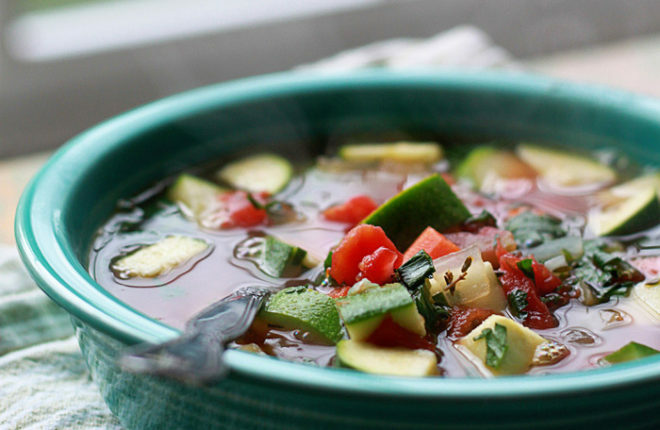 Veggie soup for every-darn-thing, basically. 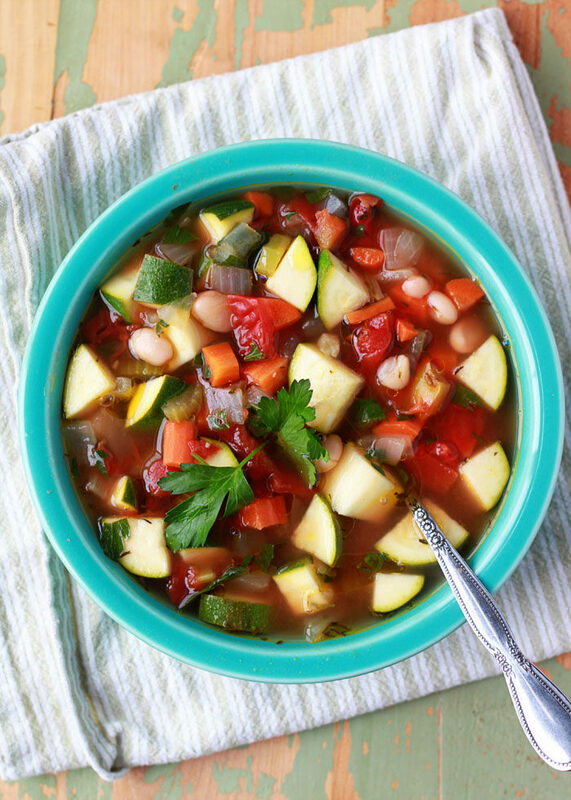 Conveniently, this Comforting Veggie Soup comes together in just under 25 minutes – because on those frazzled days when you need comfort the most, usually you’re a little short on time. And patience. And energy. So, perfect! This soup is light yet satisfying; it’s super-simple yet full of flavor. It tastes like it simmered all day, but it takes 25 minutes from that first chop of veggies to the last ladle into your bowl. That’s my kinda soup. Set a large saucepan over medium heat. When hot, add the olive oil. Add the onion, carrots, and celery and cook, stirring, until softened, about 5 minutes. While these veggies cook, chop the garlic, zucchini, and parsley. Add the garlic, thyme, salt, and black pepper and cook, stirring, for one more minute. Add the tomatoes, vegetable broth, and beans. Increase heat to medium-high. 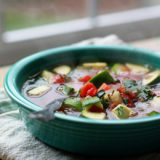 As soon as the soup comes to a boil, reduce heat and simmer uncovered until the zucchini is tender, about 5 minutes. Stir in the parsley and simmer for one more minute. Remove from heat and stir in red wine vinegar. Taste and add additional salt and pepper if desired. Ladle into bowls and top with parsley sprigs and an extra drizzle of olive oil, if desired. 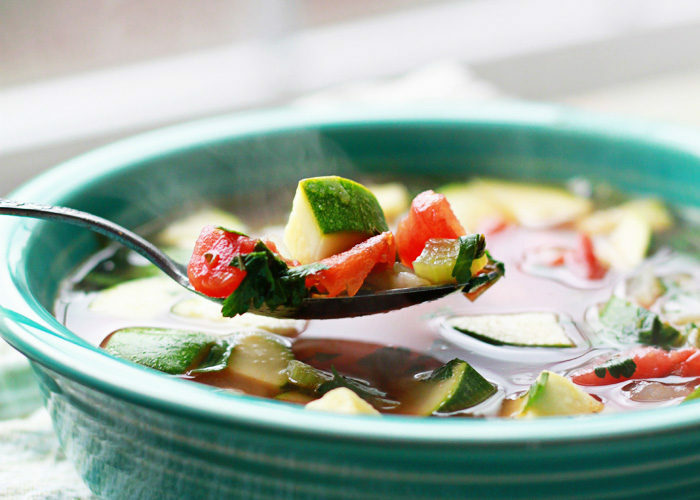 This soup is great for freezing! Let it cool then place in an airtight container or zipper bag. Label and freeze. To reheat, transfer to the refrigerator and let thaw for several hours or overnight. Reheat in a covered large soup pot over low heat. I made this soup today and oh my goodness! Delicious! You don’t mention in the method where to add the zucchini (or maybe I’m just blind) but I added it with the dried thyme and garlic and it worked perfectly. Dried thyme! What a taste revelation! Thanks for sharing this recipe.